The Oxford Minibus Company has one of the largest high-end fleets in Oxfordshire. They have a vehicle to cater for everyone, and their speciality is VIP, Executive, Luxury and Standard Vehicles and they can cater for groups of 1 – 70 passengers. The Oxford Minibus Company can provide transport for the UK and European Tours. 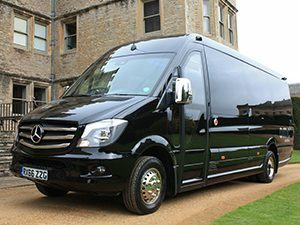 Operating throughout Oxford and the surrounding areas, the Oxford Minibus Company has built up a reputation as being the go-to-place for affordable luxury minibus hire. The company is ideally suited for Airport Transfers, Day Trips, Ferry Trips, Weddings and Sporting Events. If you are looking for luxury minibus hire at affordable prices then contact the minibus experts! All drivers at The Oxford Minibus Company are CRB checked and have CPC training. They are all trained in customer service and professionalism before they start driving for the company. All vehicles are presented to the highest of standards both inside and outside the vehicle and are all under 3 years old. The company also has extremely high standards of maintenance and they only use modern vehicles with all of the latest safety features.